Recent years have not been too kind to James Bond gamers and the studios who worked on the property. For the 50th anniversary in 2012, there was the critically panned '007 Legends' multi-platform release that ret-conned Daniel Craig's likeness (and a sound-alike voice actor) into adventures he did not have in an ill-conceived smörgåsbord of mediocrity. The game performed so badly that it practically shuttered Eurocom, the studio that made it. 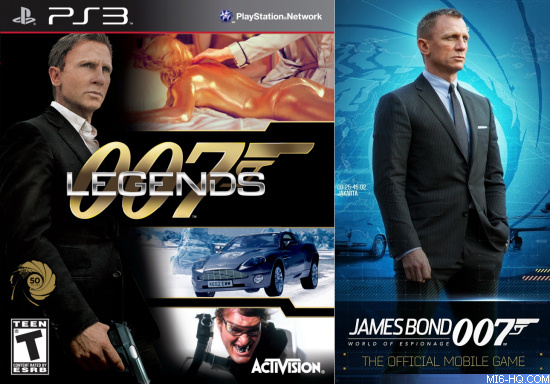 Activision then pulled all their 007 titles from online stores in January 2014 and airbrushed 007 from their history. With Activision dropping all future development, and nobody seemingly willing to take on expensive development of a AAA console title based on the property, the license was passed to Glu Mobile for a focus on casual gaming. Just when 007 gamers thought it could not get any worse, Glu released 'James Bond World of Espionage' on to the world in July 2015 without apology. One of the worst Bond games of all time was finally put out of its misery in December 2016 when it was removed from app stores. Despite having a cash cow in the Kardashian franchise, Glu Mobile saw their stock value drop almost 60% during the time their Bond game was out in the wild. MGM may have also lost about $1m due to an ill-timed equity swap deal. Between Activision dropping the license and the news of Glu Mobile taking over, Telltale Games chief technology officer and co-founder Kevin Bruner was asked which intellectual property he would base a game on if he could choose anything he wanted. "I'm a giant James Bond fan and I'm always frustrated by games that make him a mass murderer," he said in January 2014. "He's a super-spy, and that's a different skillset. The films make him less of a mass murderer, and there's not much killing in the books - more spying and intrigue." An episodic James Bond videogame by Telltale Games may become reality after all if a leaked consumer survey proves to be accurate. 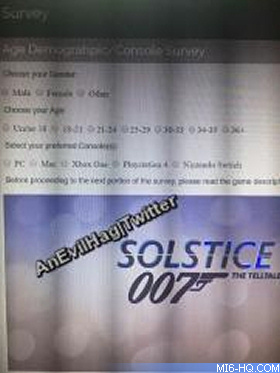 Amongst other future titles, screenshots have emerged of a Telltale Games survey that questioned people on their demographics and asked them to react to the title treatment of '007 Solstice'. No other online evidence exists that Telltale are working on the 007 franchise. No likely domain names or trademarks have been registered yet, although that is not unusual given the number of fans scraping that data routinely to discover what titles videogame studios may be working on prior to public announcement. Also, Telltale is a privately held company (unlike previous license holders EA, Activision and Glu Mobile), so there are no quarterly earning calls to discover what licenses the company may be acquiring. MI6 has reached out to Telltale Games for comment.